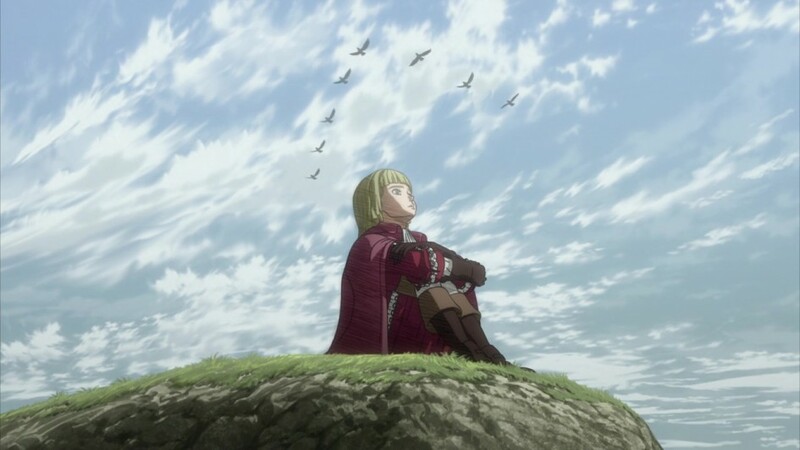 When Farnese momentarily abandons her unglamorous task of babysitting to prove herself more useful to the group, she not only potentially endangers Casca (and everyone who’ll then have to look for them), but shows how much soul-searching she still has to do. Unlike her, the talents Serpico cultivated as the Vandimion family’s servant add some lovely domestic comforts to the ragtag party’s roadtrip through demon forest territory, while his quick wits and perceptive nature will surely continue to come in handy. As docile as his demeanor may be, we’ve seen that Serpico isn’t blindly obedient and effective in combat on his own when he felt Farnese’s safety to be compromised at Albinion. Guts takes him seriously enough to answer Serpico’s almost-challenge, which unfortunately gets cut short by an adaptive choice of earlier troll attack. It’s a nice reminder for manga readers to kindly make generous use of spoiler tags whenever discussing details the anime chooses to omit. Anime-only viewers have the right to be surprised at things I would look forward to seeing animated. If only they were prettier. Check out my full review of Berserk 2017, episode 16 over at ANN.